This item has been discontinued. If you need advice on a replacement item or have a specific need you feel only this item can replace — give us a call: 512-440-1400. JVC's GY-HM710 offers incredible value with features and performance that you'd expect on much more expensive models. 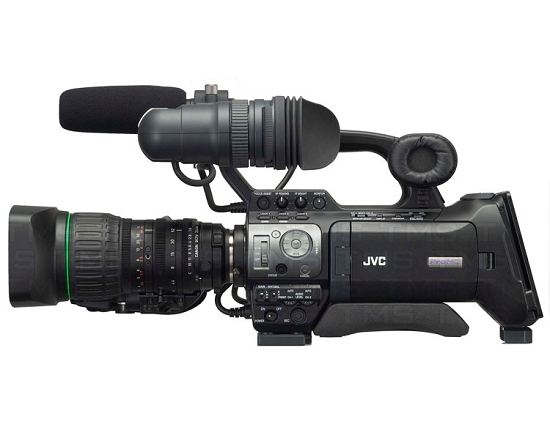 Built on the same 3rd generation chassis as our most popular ProHD cameras, the GY-HM710 combines JVC's famous compact shoulder form factor with top quality 1080 performance in both interlace or progressive modes. And for legacy applications, flip a switch an you're recording high quality standard definition files. Whether your application is mainstream production, electronic newsgathering or cinematography, the new economical GY-HM710 is hard to beat. The GY-HM710 utilizes three precisely aligned 1/3-inch progressive scan full HD CCDsone each for red, green and blue primary colorand outputs full resolution in both 1080 interlace and progressive. JVC's advanced ProHD capture technology incorporates a new patent-pending Adaptive Pixel Correlation Technique (APCT), and combined with TRIPLEX Offset Technology delivers exceptional resolving power comparable to cameras with larger image sensors. The highly efficient ProHD form of H-V pixel shift, where the Blue pixels' sensor array is shifted pixel horizontally, while the Red pixels' sensor array is shifted pixel vertically (both referenced to the Green array), enables recovery of additional luminance detail between the photosites of each pixel. By applying the Adaptive Pixel Correlation Technique, the camera achieves a remarkable improvement in image texture and resolving power in the 1080i/p modes. The TRIPLEX/APCT system differentiates between "object directions" in high frequency areas of the image, to the extent vertical, horizontal, diagonal (left) or diagonal (right), and then applies pixel compensation for lost pixels in high frequency areas. Furthermore, using a global shutter, the design minimizes wobbling during quick pans and fixed pattern noise in low light conditions, contributing to a more stable image. 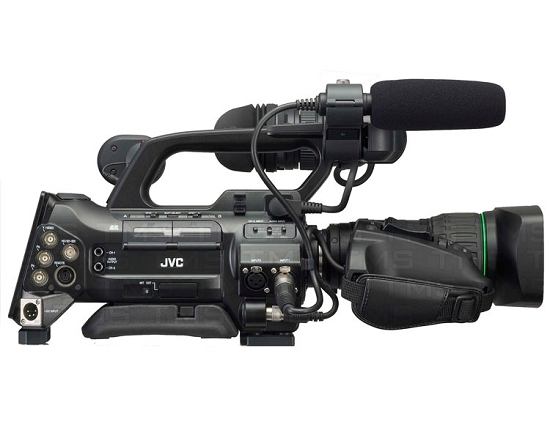 Drawing on its long experience of developing dedicated encoders for the broadcasting industry, JVC has equipped the GY-HM710U with a powerful MPEG2 encoder capable of compressing full 1920 x 1080 HD video at up to 35 Mbps. The result is the pristine picture quality that professional users demand, from a surprisingly compact and lightweight shoulder-mount camcorder. MPEG2 long GOP is the most widely accepted broadcast standard compression supported by all popular editing systems and broadcast servers. In the HQ mode, the encoder operates with a variable bit rate average of 35Mbps. The SP mode records at a constant bit rate of 25Mbps to ensure compatibility with a wide range of equipment. The GY-HM710 supports major signal formats including 1920 x 1080, 1440 x 1080, and 720 x 480. Responding to the needs of the industry, the GY-HM710U, in addition to its capability as an HD recorder, offers Standard Definition recording for maximum flexibility. 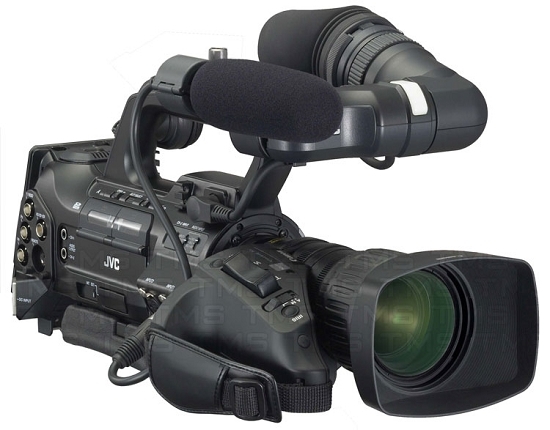 Recording in SD provides a time-saving alternative to down-conversion of HD material for SD broadcasts, which is still an industry standard in many countries worldwide. This feature offers a fundamental advantage for professionals with time-sensitive SD workflows. The GY-HM710U includes a detachable 14x Canon KT14x4.4KRSJ HD lens based on the superb optics found in more expensive HD lenses. Its superior MTF provides higher resolution than typical "stock" lenses. The lens has improved lateral and longitudinal chromatic aberration characteristics and is ideal for full 1920 x 1080 imaging. Canon's internal focusing system minimizes "breathing" compared with typical focusing systems. Internal focus also makes possible a more efficient light blocking lens hood. ENG shooters will be pleased with its wider angle and consistent brightness from 4.4mm (wide) to 62mm (telephoto) with no F-drop. Operation is the same as with all professional lenses, with mechanical control of focus, and servo or manual control of zoom and aperture. 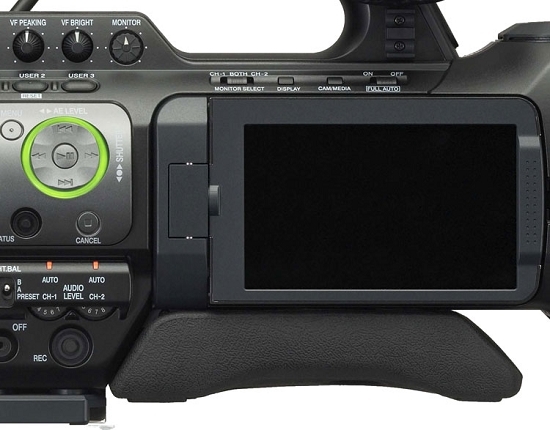 Complementing the new high resolution viewfinder is a large LCD flip out monitor that can be used in recording, playback, clip management, and menu operation. The 4.3-inch 800x480 WVGA LCD offers a 16:9 aspect ratio and provides a wide array of monitoring and setup indications. It is specially designed to reduce surface reflections and glare to maintain a clear, visible, bright view during outdoor recording. Menu items are easily selected using user-friendly setting cross keys. 20 second Pre Rec (retro cache) function prevents "missed shots"
HDSDI output, Can also provide downconverted SDI outputlive or playback. Full GY-HM710U Specifications at pro.jvc.com.